EBRO, Fla. (WJHG/WECP) – While most college students come to Panama City Beach to party for spring break, one group of fraternity brothers is spending their time off giving back. 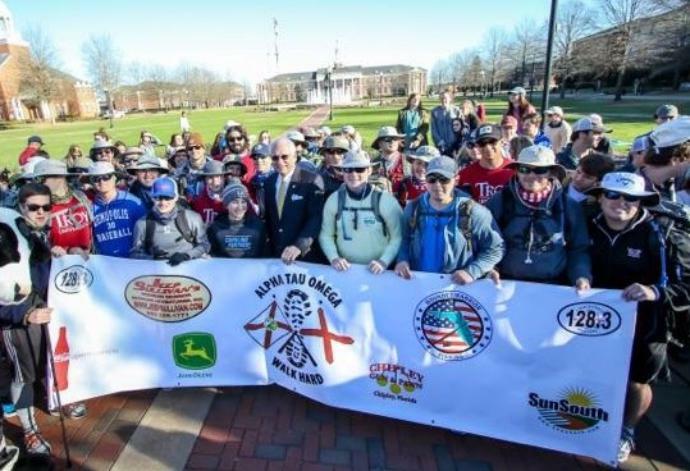 One foot in front of the other, members of the Kappa Beta Chapter of the Alpha Tau Omega fraternity from Troy University are going the extra mile. “We’re taking the first six days of our spring break and we are walking to the beach to raise awareness and money for the Jeep Sullivan Wounded Warrior Outdoor Adventures,” says ATO fraternity brother Dakota Morris. The group says this is their way to support those who’ve defended our freedom. “A couple wounded soldiers come speak to us at night and their stories are just, what they’ve given up for our country is just crazy. And so for us to be able to help them in anyway, that’s why we do this,” explains another fraternity brother, Joshua Bryan. “Me walking to Panama City is a lot easier than being shipped off to Iraq and missing time with my friends and family,” says Taylor Edwards, who is also a member of ATO. They say the six day, 128 mile hike that began in Troy, Alabama pushes them to limits they never thought they could accomplish. “You basically have to have the mental toughness to keep pushing yourself forward and to never give up. No matter how much pain you’re in or where you’re at on the walk,” adds Bryant. “For us as walkers, just because we have some blisters on our feet and everything like that, I tell the guys that this is nothing compared to what these men and women have done for us and continue to do every single day,” adds Walk Hard Director and fraternity brother Dash Merritt. At the end of their hike, the guys say taking part in this journey will stick with them for the rest of their lives. “It’s not just going to be some spring break we forgot about. It’s really going to be something that’s gonna shape us and mold us as men,” says Merritt. The group will end their trek Thursday afternoon at Pier Park around 4 p.m.
Life’s A Beach Real Estate is a full service Real Estate Company on the beautiful Emerald Coast. Our headquarters is located in one of the most unique condominium buildings on the beach, The Origin Beach Resort. We have over 700 condos for sale on Panama City Beach as well as beachfront and vacation homes in the world famous 30A area. A large part of our business is Condo sales but we also assist our clients with new homes, investment opportunities, commercial properties, new construction and development.